I had the opportunity to meet Elle at a conference called FinCon and without a doubt I knew she had to be a guest on the podcast. She is a personal finance blogger and podcaster who focuses on educating couples on making their relationship and money easier to manage. I had the trifecta. I had the credit cards, I had the car loan, and I had some student loans w/Elle_CM. Being open and honest was the best way to start off our marriage even though it may not have been financially where we wanted to be w/Elle_CM. 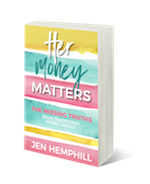 Don’t miss out on the fun, join the Her Money Matters Community (click here to join)! I’d love to hear from you! What are your thoughts about cosigning (from either side of the field)? Be sure to share in the comments below! [00:00:26.7] JH: Hey, this is Jen Hemphill your host of this podcast. I am thrilled to have you here. We have two more episodes before we celebrate the Her Money Matters Podcast one year birthday. In episode 55 that will be the one where it’s a special episode where I’ll be celebrating with you, but the party is not just happening on episode 55. So if you haven’t joined us already, it’s also happening in our community and it is ours. It’s not mine, this is our community so don’t be shy, come on over and join us, will you? All you need to do is go to Jenhemphill.com/community. Today, I have a special guest to introduce to you who I know you will adore. She’s very down to earth which I absolutely love because hey, that’s my type of people. Down to earth, real, that’s what I love. So this is what you’re going to learn in today’s episode, you’re going to learn what exactly her mom did as a single mom that jump started her journey with money. You’re also going to learn why she doesn’t like the idea of co-signers and it’s not what you’re probably thinking. We’re also going to learn the trifecta she brought into the marriage and how they handled this as a couple. We’re also going to learn why couples shouldn’t start with budgeting as a starting point, but what they should do instead. So let me share with you a little bit about Elle Martinez or as I would say, “Elle Martinez”. She is the founder of Couple Money and that is a personal finance site and podcast focused on helping couples build up their finances and marriages. She is also the co-author of Mastermind: A Formula for Success. She and her family lived in Raleigh, North Carolina. So I’m excited to introduce you Elle Martinez. Let’s go and jump right into the conversation. 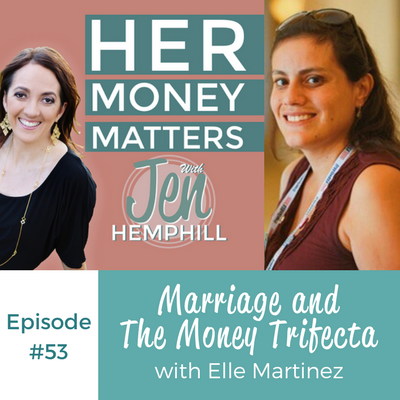 [00:02:42.4] JH: Welcome Elle Martinez to the Her Money Matters Podcast. I’m excited to have you here. [00:02:47.3] EM: I’m excited to be here. Thank you so much. [00:02:50.5] JH: No, it’s been such a treat just getting to know you from FinCon. I’ve had several FinCon-ers on the podcast, so it’s really neat to have yet another FinCon-ner. So you ready to dive in to the questions? [00:03:04.5] EM: Yeah, let’s do it. I’m excited to talk about this. [00:03:07.5] JH: Perfect. So the first thing I want to know about, and I know listeners want to know, is how did you grow up around money? So tell us from childhood, maybe things that stick out in your memory. [00:03:21.6] EM: Okay, well you know what? I think, like a lot of people, I’ve had parents and my mom later on when it was just her and the three of us had intentions of teaching us money like with the allowances and everything but the reality was time was just limited. She was a single mom working taking care of three kids and just life got into the way. So I learned by seeing what I noticed and money was scarce on some months so I think that gave me the idea of I have to make my own source of income and just growing up — and I think, also I was the oldest so I felt like I needed to help out. [00:04:13.8] JH: I hear you. [00:04:15.0] EM: Yeah, so I kind of started out, I can tell you I was working in upstate New York back when the whole bottle recycling thing was in. I was the neighborhood kid that was collecting everybody’s recycle. You know, for that five cents because I made a lot of money. [00:04:34.6] JH: Yeah, I do remember those days. [00:04:38.1] EM: Yeah and I just always grew up trying to make some side money here and there and then when I was 14, I was working part time and I think that work ethic I feel really proud of. Now in terms of spending, I felt like and I think a lot of people feel this way, you work really hard and you take care of the essentials but, “Oh I deserve this.” I had that kind of mentality. Not that I was saying that luxury, I needed to go on trips and do all this but in college and just early adulthood, I was like, “Man, I worked so hard I should get this car loan,” even though I was a working college student. So I was only working part time and I still got a car loan for my Jetta and lesson learned, don’t do that. [00:05:33.6] EM: So yeah, I just felt like there had to be something to show for my money and at that time, it was stuff and I got engaged to an awesome guy and we were going to do the responsible thing Jen. We were going to talk about our money before we got married. [00:05:52.9] JH: Did that happen? [00:05:54.0] EM: We did and I was surprised. So I’m thinking, “Okay,” we both had okay cars and we did these cool, fun, cheap dates. So I am thinking by looks, we are the same financially. He had no debts except for one semester student loan, which he was going to pay off when he graduated. I had the trifecta. I had the credit cards, I had the car loan, and I had some student loans from my last two years. [00:06:28.6] EM: So that was embarrassing. [00:06:32.2] JH: And how, when you had this conversation — so you had a conversation prior to getting married. So he knew before you got married that you had this debt and he had that debt and you said he’s an awesome guy, so obviously it didn’t matter to him. You were basically going to get married and do this thing together, it sounds like. [00:06:58.3] EM: Yeah, so I found out just how awesome he was. I think mentally where I was, I felt really bad. I kind of felt embarrassed and I felt like, “Okay, I’ve got to pay this off,” and he was like, “We’re getting married, this is our debt and we’re going to have a plan,” and that made me feel, one, that made me feel better getting married. But two, that also motivated me. So being competitive, I had made a goal that before we had the wedding I was going to pay off my credit cards and they were college credit cards. So it wasn’t anything crazy just stupid spending. So I was able to do that, my competitive side won out and he was also helpful during that. So I am always a big believer that when you’re in a relationship and you guys are going to get married, have that conversation. Yes, speaking from experience it’s not always the most comfortable or pleasant but you can be surprised at the generosity you can get and receive from that and get the ball rolling in your relationship. [00:08:14.5] JH: Absolutely. We had that same conversation but we were switched. We switch sides where he had the student loan debt and I had no debt and he was feeling the same way. He felt ashamed, he didn’t feel good about it but I’m like, “Well, if we’re getting married we’ll do this together,” and that was it. For me, it was not big deal because I knew we were going to tackle that together. [00:08:43.7] EM: Yeah and I think being open and honest helped because of course, you’re going to ask questions like, “Well what is the debt?” He found out that it was just some careless spending and I told him the amounts. I didn’t had the exact number but I got back to that later but I gave him ballpark. It wasn’t like, “Hey honey I was gambling,” or, “I was playing the lotto.” Because those things are something that you’ve got to work out. [00:09:11.6] EM: Yeah, definitely being open and honest was the best way to start off our marriage even though it may not have been financially where we wanted to be. [00:09:21.5] JH: Perfect, I love that. Now tell me, so you took us through going around money and you mentioned your mom had the best intentions with teaching you about money but tell us maybe some of the money conversations. Since you said she has the best intentions, it seems to be like there were some money conversations going on there. Can you tell us a little bit about that? [00:09:47.5] EM: So my mom was in the education field, a teacher and different positions, different grade levels and so forth and depending on the school system sometimes the pay was great and sometimes the pay wasn’t. So this was her passion and her calling so she was definitely going to be, and she still is an educator. A lot of the conversations we had were very practical in terms of — and I am grateful for this. We would do the budget together. [00:10:20.0] EM: Yeah and it was a single parent household, so a part of it was also she wanted to have a second pair of eyes and I was fairly responsible and it got me to see that there’s a reality. Growing up as kids, I mean it’s natural. I’m a parent now, your kids are like, “Mom, I want this and I want that,” right? [00:10:42.9] JH: I’ve never heard of that. No I’m kidding. [00:10:46.6] EM: I have a four year old and we started her an allowance because if you’re asking and you’re old enough to start asking for money, we can start teaching you about it. [00:10:57.0] JH: Oh absolutely. I think you can start fairly — I mean you know your kid best so you just take those money teachable moments as they happen and you go for it. [00:11:09.0] EM: Yeah and so my mom kind of did it, but being a parent is hard. Being a mom with three kids is just time consuming on top of the work you have and the work at home. I think she wanted to have more regular conversations about this. So they were limited in scope because we’re just talking about the budget and if there was a debt or towards one goal. So it was kind of very narrow, very specific. We didn’t have any conversations about investing. The only thing I knew was you invested only for retirement and whatever plan was offered, ask HR and stuff like that, you know, the basics. I knew that I wanted something different. Go ahead. [00:11:58.3] JH: No, I was going to say but what she did is fabulous just because who gets that exposure early on? I mean a lot of the kids that even go to college, not that you need to sit down and balance a physical checkbook nowadays but they go to college and don’t have that exposure. So you had that exposure, you were the second set of eyes and I think that’s phenomenal because I think that gave you more and you were more ahead of the crowd, if you will, in that sense because you had that exposure early on. So I think that’s fabulous. [00:12:41.8] EM: Yeah and of course being young, I didn’t appreciate until much older. [00:12:46.9] JH: We are all like that, right? [00:12:48.9] EM: I know, you don’t appreciate your parents until you’re an adult and then you really appreciate your parents when you become a parent. So I am grateful that she is open about the budget and that definitely gave me a sense of “you only have so much so try to make the most of it”. My problem was I had this other mindset of, “I am so tired of having a very strict budget and I got some extra money and I want to spend it”. I just had to learn that you have to be an adult about it and don’t look at a budget as constraint. It’s actually helping you give freedom to put that money towards what’s really important towards you. [00:13:32.8] JH: It makes sense. Yes, I agree and tell us a little bit about your best money memory. [00:13:39.1] EM: My best money memory? I’m going to say, and this sounds a little weird. So fast forward a few years, we found out that I was pregnant with our first kid and I mean you know this is life changing and everything but we’re in a better financial situation but we sat down together and we just got a plan with finances. I know that sounds dry doesn’t it? But the reason it was so important to me and I think just was special was I got to focus on becoming a mom and the process of the transformation because at that time I was self-employed, still am and you know that if you don’t work, you don’t make money. We had to save up basically for my maternity leave and I think that was a huge blessing because for those first few weeks, that month and so and you’re adjusting. I am worrying about my kid and my family but I didn’t have to worry about the finances on top of that. [00:14:53.7] JH: Right, that’s beautiful and what would you say is your best money spent? [00:14:59.2] EM: Best money spent, oh you’re good with these questions. I will say our home. [00:15:11.2] EM: And both times, and the reason I say this, this especially is we knew that these were going to be like the biggest purchases but we said, “Okay, we want this.” Again, it’s like we can get the most house or let’s get a house that feels like a blessing and so we got a house here, a big yard for our girls, really nice quiet street, neighborhood, we are around our friends. We’re not showing off to anybody, we want to take care of our kids and we want to have enough freedom and there’s no true security but some security knowing that if the income drops and so forth we still have a roof over our heads. [00:16:34.8] JH: Absolutely. No I agree, and it’s really knowing what purpose your home is going to serve. I mean granted it’s going to put a roof over your head but how much money are you willing to put to buy a home? It’s not — “Are you comfortable with a two, three bedroom home if you have kids? Will the kids share a room? How long do you think you’re going to be in it?” All those sorts of questions that you definitely want to consider when you’re buying a home. Of course, there’s a lot more. [00:17:12.3] EM: Yeah and you know how it is, how you spend your money is rarely just about numbers. We’ve had a lot of conversations and I thought we did pretty well with our first house, a town home but we got better. Because now having the experience we know, “Oh, this is how we actually use it.” We like having people over so we wanted to make sure we had the space for that. And the location, yeah, we could go in this fancy, all-amenities neighborhood or there’s a neighborhood that has plenty of amenities for us based on our schedule and we’re around our loved ones, our friends that we hang out with anyway. [00:17:59.1] JH: And tell me — so we talked about the best money spent, so let’s talk about the biggest money mistake. [00:18:05.7] EM: My car. The Jetta. [00:18:08.2] JH: Yeah, you did mention that. So tell me, I was curious about that. Tell us. [00:18:12.1] EM: That was wrong on all accounts. Okay so if they asked you to have a co-signer don’t get it. So like I had mentioned to you, I was a working college student, which meant I was going to college full time and I was working 20 maybe 25 hours with my internship a week so I had a full schedule and yes, I did need a car but I didn’t not need a car loan. I went to the dealership, I had actually previously had like the $500 cars, the college beater cars and that should have been fine, but long story short, I had gotten into a car accident so the insurance sent me some money and I could have bought a car with that instead of making that a down payment. So the interest rate was ridiculous, I didn’t know that at the time. When you go there and they’re asking for a co-signer, my mom was generous to do that and now I feel — I felt so bad, and the good news is we paid that off early. Because I did not like the idea of my mom being on that and co-signing. I even told her that, “I really appreciate that you did that but please don’t do that again if I ever come to you, please don’t,” because she will be on the tab. Even if something bad happened to me and I had the best intentions. [00:19:39.7] JH: Right, I hear you. [00:19:40.5] EM: Yeah and I’m not a person — I wouldn’t call myself a car person. To a degree yes, there are some cars that I think are absolutely ugly and I do want a safe, reliable car that’s good on gas. So when we bought our Honda Accord after we had the baby, we saved up and we paid cash for that and that felt so good. [00:20:06.3] JH: Awesome, love it, love it. Yeah, we’re currently with cars where cars are important because we know that we need it to get to places but for the past, let’s see — I have to think of where we lived to figure out how many years, is that sad? But basically for the past four years, we’ve managed to live on one car and that’s just well one, my husband has been either away or it’s worked out that his job is here in DC, he takes public transportation. Or I think more now, we’re going to need another car just with the demands of our kid’s schedules, but we’ve managed to do that just because it wasn’t needed and we were able to do without it and that has helped us. So I am curious as far as take us through maybe about a month just in general terms of how you manage your money. Do you sit down with you and your husband? Because obviously you have a great relationship, are able to talk about money. Do you use certain tools, certain apps? Tell us a little bit about that. So it’s fun? I know I’m a money nerd but it doesn’t have to be stressful. I remember the first few months were because it was like, “Okay we’ve got to pay out this car debt and paying down the student loans,” and we wanted to save for a house. I mean spread out over the years, but as you check certain things off it gets easier and easier and you get somewhat of a flow. I’m a big believer of automating. So for us, we have our joint account. Pretty much all of our money goes into our joint checking and joint savings and we have individual accounts but we know each other balances. That’s part of the monthly review and the money dates and stuff. That’s how we do it, because we had that since we were in collage, the individual accounts because I like to surprise him and he likes to surprise me. And we also have what I call “judgment free spending” because you know how it is. We each have something like I love to spend on books and I’m excited that we are two miles down from the library so hopefully that will save me some money and he’s definitely a computer guy and he saves up for his different things but there’s never any secret. So we talk on our money date, “Hey, how’s your checking account looking? How that checking account looking?” Because transparency in a marriage is — because money isn’t just money, you know? It is money but it’s more than money. So that’s our rule. We share and if we have to access it in an emergency, I hope nothing happens to him, I can do that. [00:23:52.2] JH: Perfect, you have that clarity, you have had those talks, you have a system in place and in case, like you mentioned, something happens and you automate. Do you use a spreadsheet, do you use a special software? What do you use to manage? [00:24:11.2] EM: So I think part of it is because I’ve worked with personal finance a lot, I have different tools. We create our budget with Google Spreadsheets and we share it. This is actually a great month to ask because now we have a new budget we’re working out with this new house, new mortgage and everything. So we’re working together on all of our regular expenses. The semi-annual like life insurance payments and we’re working that out and we give each other feedback. So what’s nice about that is I put a note for, “Oh we’re going to eat out, we’re going to do $150,” and there’s a note that automatically says, “Did you see the last three months spending?” And then you adjust because it does in cycle. You might break it down to groceries and eating out and as it approaches, I get a text from Mint and also on Fridays we get an update from Mint, both of us on how that goes. So that’s what we keep in mind and now I’m kind of migrating to Personal Capital because we’re now in the stage of more investing and getting that big picture. But yeah, the tedious stuff, I love that we can automate it and at the same time you have to have some way to check in with one another because you know mistakes happen. [00:26:11.3] JH: Yes and I love how you’re using Google Spreadsheets because it does have that function. I mean just thinking, if money is a hard topic to fit and just talk face to face about, it could be just starting off a little bit of a conversation in the Google Spreadsheet because you can make a note and it’s like texting one another, right? But right on that especially. So I think that’s just that can really help depending on what’s going on in the relationship but just food for thought. [00:26:45.4] EM: Yeah and I know that something has changed since I started, I used to write about like “the first things that you guys need to do is come up with a budget”, which is essential but knowing where you are, I totally say that that’s important. You have to know where you’re starting, but you also have to know where you’re going. If I could redo it, we should start off with our why first, what do we want to do and why do we want to do it? And it makes it easier. It takes the pressure off. [00:27:52.0] EM: I understand now you’re living and when you’re married, you don’t understand. You read about it, “Well it’s easy as, oh, we’ll just talk it out.” No, when you’re in there and you’re discussing it — it does and you might be surprised because I think couples forget. You have your joint goals and then you have your individual. Maybe it could be career or personal goals and you’re still going to support each other on those but you’ve got to know what they are. [00:28:26.0] JH: Absolutely. I hear you so tell me, we’re wrapping it up because I know you have this podcast — you know this podcast is all about making money simple and taking control of it, so how would you finish this sentence: Her money matters because ____. [00:28:45.3] EM: It allows her to achieve her dreams and take care of her loved ones. [00:28:50.3] JH: I love it. Well Elle, this has been fabulous. I really appreciate you joining us today. We had such a great conversation and I enjoy getting to know you even better from the conversations we’ve had before. So this has been really a treat for me so I appreciate having you on the show today. [00:29:10.8] EM: Oh this was so much fun. Thank you so much. [00:29:13.8] JH: No, thank you. [00:29:15.9] JH: Down to earth and super sweet that is Elle Martinez. I love everything that she shared in today’s episode but the one thing that stood out for me and I don’t know if it stood out for you as well was how she doesn’t agree on the idea of the co-signer. I will definitely tell you my thoughts in a moment but first, you know what time it is, right? I want to give a quick shout out to Christina in Toronto, Canada. She has jumped into the conversations in our community from the get go which I have absolutely love. I know especially for the ones that are new in the community, it’s not easy to jump into the conversation or ask questions about your own personal money situations. So Christina definitely you have served as an example and just know that that, and others that do the same, eases the conversations for those that are maybe a little bit shier or just not comfortable quite yet so I want to thank you for that Christina and also for the positivity that you bring to the group. I’m excited to have you in there. So let’s get back to the thoughts on the co-signer. Usually, people are more — when we think of co-signers and when people do not agree on being a co-signer or not agree on being a co-signor, but more are against the idea of co-signing, the thoughts are more on the main person maybe a young adult, or whatever the case may be, not being fully responsible or maybe not necessarily being fully responsible but not taking care of paying the loan. That’s the fear, right? But you never think of or you have never really talked about how Elle spoke about it where she was the one that needed the co-signer but she was more thinking along the lines of she did not want to leave her mom that burden if something were to happen and she weren’t able to pay it, right? So I thought the roles were reversed here and I thought that was really interesting where it was the person that had the co-signer not agreeing with it because of the burden that you could potentially leave. Where it’s usually on the other side where maybe you’re asked to co-sign and you’re reluctant because you don’t want to take on the burden but this time, the roles were reversed. She was the one who had the co-signer and did not want to leave that burden, that she didn’t agree with. So I thought that was an interesting take on it, an interesting spin, and I don’t know if you caught that. I just thought that was really interesting so I wanted to just bring it up. So that is it for today’s show. 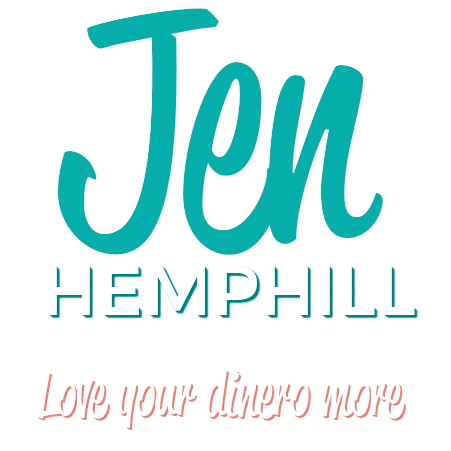 Don’t forget to join us over on the free community over at Jenhemphill.com/community. I want to thank Elle Martinez for joining us today, for sharing that money story. Be sure for you listening to check out the show notes on where to find Elle at Jenhemphill.com/53 and coming up next week in episode 54, I have the mystery man that I have been telling you that I’m excited to introduce you to. So that is episode 54 next week, so be sure to tune into that. So we will talk again next Thursday and thanks again for joining me.